From America’s leading authority on cooking sustainably raised meats comes this concise nose-to-tail guide for home cooks to prepare grassfed beef. Shannon Hayes has selected the best recipes from each of her three prior grassfed cookbooks, combined them with her signature easy instructions and explanations, and served up a simple, easy-to-use cookbook for the newcomer to the world of grassfed beef. This book offers a wide array of time-tested family-friendly recipes, with chapters dedicated to pan-frying and oven roasting; braises, stews and soups; ground beef, grilling and barbecuing, as well as a complete section on using the bones and fat. 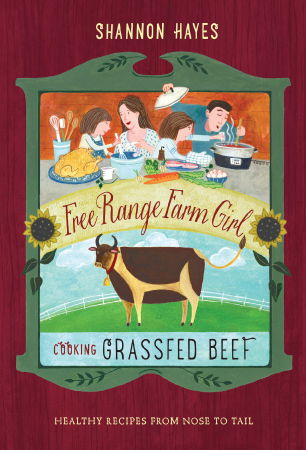 Free Range Farm Girl: Cooking Grassfed Beef offers clear information on making cut selections, candid explanations about navigating the world of farm-direct purchasing, and up-to-date information about ecologically friendly and humane livestock farming. As with all Hayes’s cookbooks, the culinary concepts are easily learned, and the extensive section covering spice rubs, marinades, and sauces will liberate home chefs who long to improvise and invent their own grassfed beef dishes. This little volume is the perfect introduction to Shannon Hayes’s vast writings on the subject of sustainable meat.